Starting with a good Amazon link is important, not only for proper localization and monetization of your international audience but also for maximizing conversions from your local traffic. The old saying “garbage in, equals garbage out” holds especially true when it comes to ensuring that your links are being properly localized and that all of your customers are being sent to the best destination to make a purchase. Unfortunately, it can be difficult to figure out which of your links may not be functioning as expected. For example, Amazon products are constantly updating, going out of stock, or being pulled from the marketplace entirely. This then leads to broken links, unfavorable conversion rates, lost revenue and unhappy customers. Luckily, the team at Geniuslink is here to help! As clicks flow through our system we are constantly monitoring them to ensure proper link translation, affiliation, and reporting. Building on that, we are now able to accurately monitor these links for various issues, such as being out of stock, that could be affecting the success of your Amazon links. 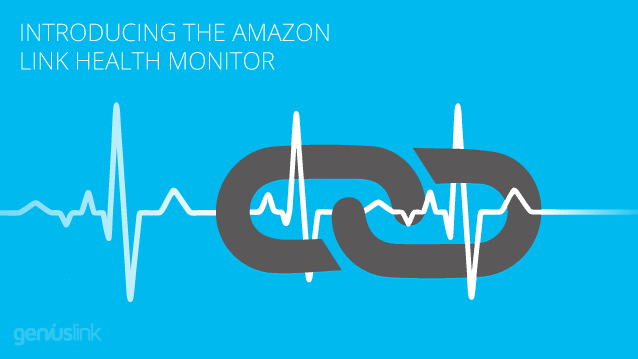 Introducing the Amazon Link Health Monitor! 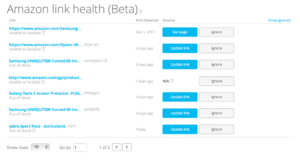 The Amazon Link Health Monitor is an automated system that continuously monitors every click to an Amazon product that runs through our service, and it will alert you to issues that may be affecting your links. For example, if we are no longer able to access the product within Amazon’s product catalog, or if the product is now out of stock, we will notify you to ensure that you can keep all of your links healthy (and your conversions high). “Unable to localize“: Since we’re not receiving product information from the Amazon API, we can’t take full advantage of our product matching algorithms to find the product across Amazon’s regional storefronts. Please note you can always override our localization and set per-country destinations manually by editing this link and adding Advanced Targets. “Out of stock“: The product is currently out of stock and your conversion rate is likely suffering. Note that the out-of-stock status can be temporary! Be sure to test the links and use your best judgment when deciding whether to change a link destination. It is important to note that even though you may be receiving errors on your links, they will always remain properly affiliated with your parameters. Where can I find the Amazon Link Health Monitor? 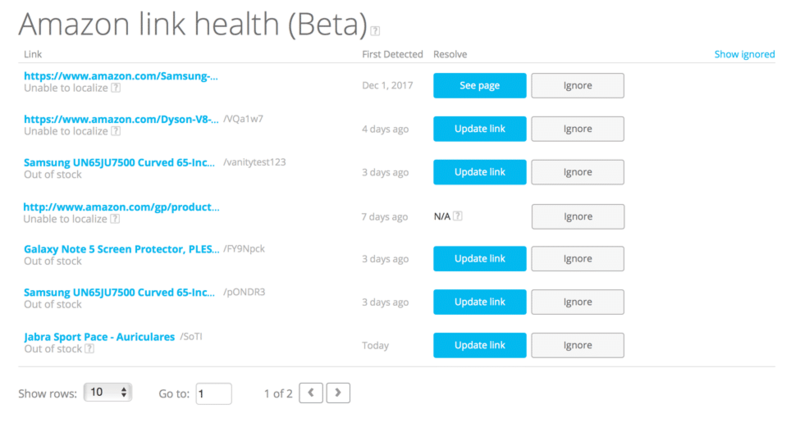 In addition to the link health report within the dashboard, starting in January 2018 we will also alert you by email if we detect one or more “bad links” that we haven’t already brought to your attention. This will allow you to stay up to date on new links that may have gone out of stock or have errored out in the past day. Of course, if you’re not interested in receiving the emailed report, you can always toggle your email notifications on and off from the tools page within your dashboard. How do I resolve my link alerts? When you receive a link alert, either through the dashboard or in an email, you can start resolving right from the dashboard or email. Double check your link first and then either update the short link in the dashboard or the original Amazon link directly on your site, with another link to the same product or something similar. Sometimes Amazon makes whole categories un-available via their Product API so it’s always good to check the link once you do change it (use the Visualizer in the dashboard or publish the new link, click it and then check your Link Health monitor again). In addition, if the product that you are linking to is not available within the Amazon API and cannot be translated, you can always use our Advanced Links to create custom rules and build your own globalized link! While Amazon forbids you to “artificially generate clicks or impressions on your Site or create Sessions on the Amazon Site, whether by way of a robot or software program or otherwise” (Associates Operating Policies) with the Amazon Link Health Monitor you aren’t actually clicking your own links, instead we’re checking on the product’s status using their API. It’s our hope is that this will be a huge time saver and eliminate the manual process of checking for “broken” links and in the process further increase your revenue by ensuring your links are always converting as best as they possibly can. Check out this knowledge base article for more details and, as always, reach out if you have any questions and please share your feedback!